Apocalypse is never a valid reason to stop enjoying your favourite tunes. Look at Emmet who keeps his chin up when the world around has almost been destroyed. 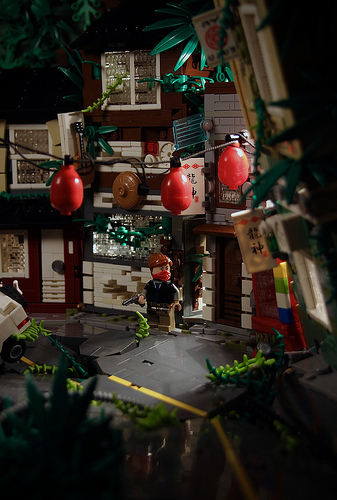 British LEGO fan and builder justin_m_winn peeks inside Emmet’s hideout equipped with high-end stereo. This two-layers vignette has a lot of details smoothly mixed together. 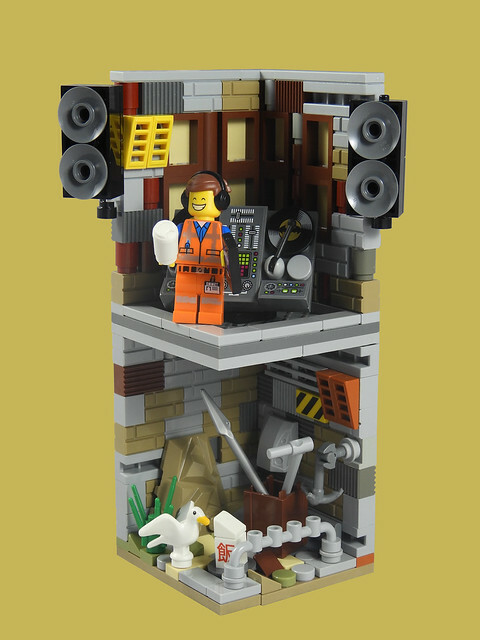 A room like this would fit somewhere inside 70840 Welcome To Apocalypseburg set; just imagine Emmet shaking up all of his neighbours with Everything is Awesome! Emmet isn’t alone in keeping his chin up during the impending LEGO apocalypse. Justin has also built “Apocalypse Benny” (with his robotic arm) a wonderful display vignette, using super-rare pieces from original Classic Space sets. 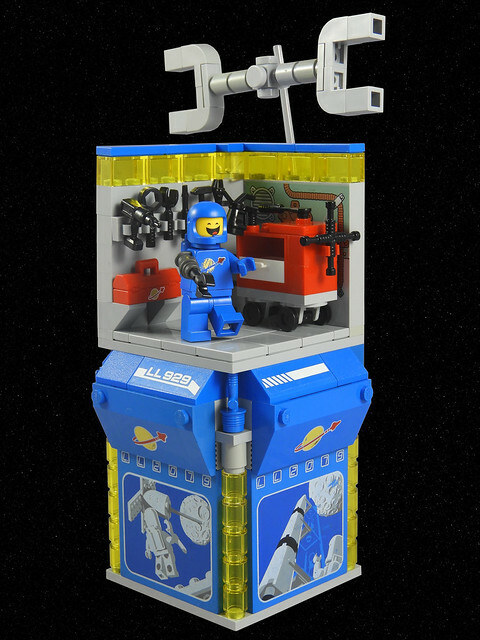 The LEGO Movie 2’s range of sets has got us excited, not least because of Classic LEGO Space astronauts in multiple colours. 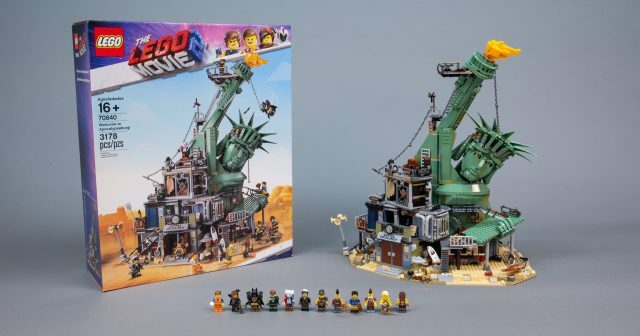 But what really set hearts aflutter and pulses racing here at Brothers Brick was the reveal of the massive 70840 Welcome To Apocalypseburg — a shanty town built around a fallen Statue of Liberty, apparently Emmet & Co.’s new home town in the forthcoming film. 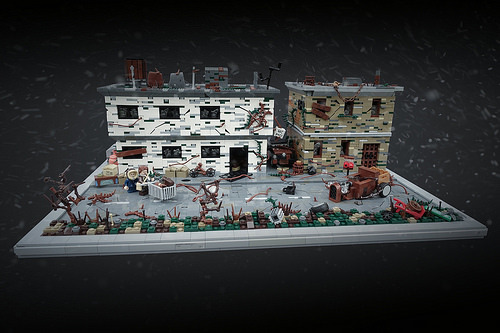 70840 Welcome To Apocalypseburg includes 3,178 pieces and 12 minifigures. 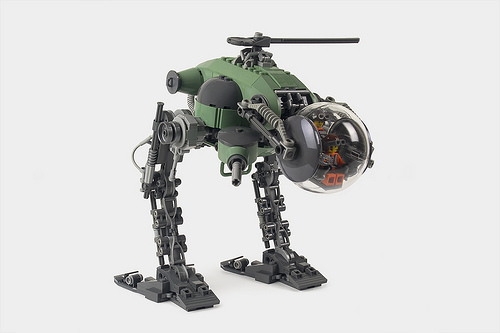 The set is available now for LEGO VIPs, and is on general release February 1st, 2019 from the LEGO Shop (US $299.99 | CA $399.99 | UK £279.99). The future looks bleak, but at least the decorations are still holding strong! It seems as though building a scene set in the year 2049 is the thing to do these days, no doubt in part because of the new Bladerunner film. However, this scene by Eddy Plu depicting Tokyo in the year 2049 has some great elements that set it apart from the crowd. 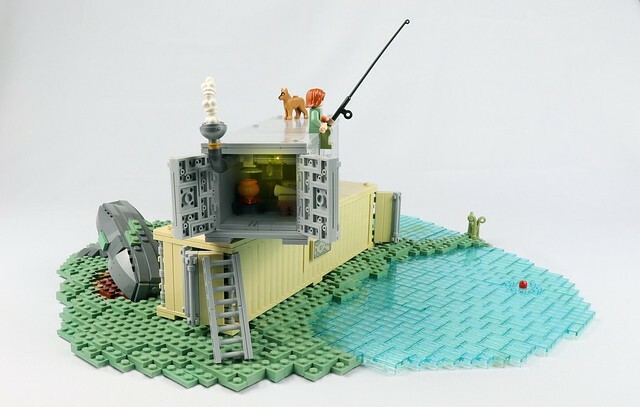 Usually when building LEGO scenes, builders tend to focus on the background, and rarely is there anything in the foreground. But here, the Eddy has added some leaves and other objects to the foreground, giving the scene a higher degree of depth and making it much more interesting to admire. Also, don’t overlook the cracked and uneven street, which makes it seem like either an explosion or an earthquake has happened in the future, and the nice curve the sidewalk and buildings situated on it seems to follow suit in looking precarious. 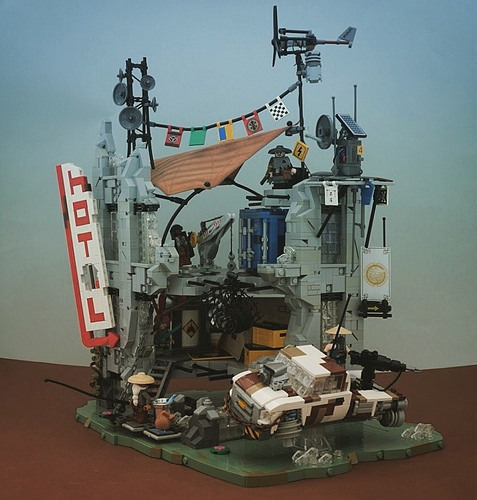 Post-Apocalypse or “ApocaLEGO” is a LEGO building theme which can see more dull brown and grey creations than the most boilerplate of steampunk. 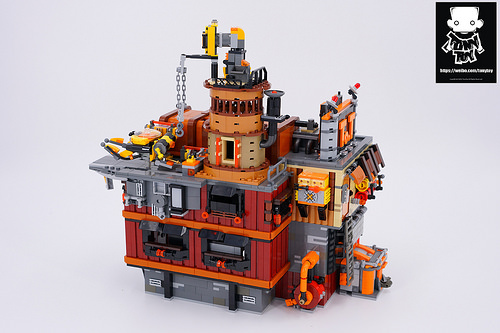 Here’s a glorious exception to the rule by Rat Dude: an imaginative take on the genre which sees enterprising survivors build a moveable dwelling out of transport containers and a truck — like some mobile version of the stacks from Ready Player One. 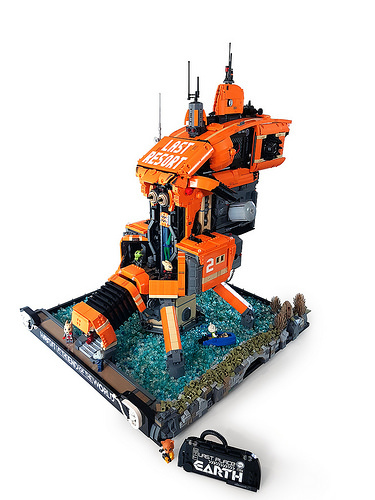 Revelling in its central idea, this model is gloriously detailed, festooned with every likely requirement of the wasteland warrior catered for — solar power, fresh water, air con, a vegetable garden, and even an outhouse for the effective disposal of waste! This thing is well worth a closer look, and the builder has provided some imagery of various angles. Great attention to detail on the model — just look at all the little touches that have been crammed into it. This layer upon layer of detail has created an engaging model within a building theme that usually leaves me cold. I can’t imagine a better ride in which to tour our dystopian future. If Santa and his elves survived the apocalypse, they would do very well for themselves in an outpost like this, built by Tony Toy. Without a landscape to define its locale, it would be equally at home on the edge of a toxic ocean, or the top of a rugged mountain peak. 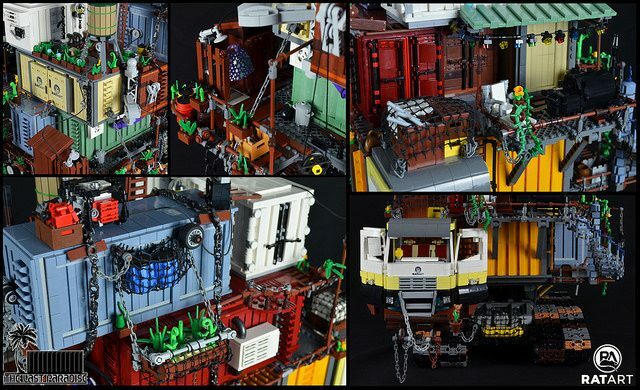 Besides a number of industrial details like an abundance of pipes going here and there, a tower crane for servicing what could be a submersible, or a drone, and a machine shop for working on a well armored truck, there is a thoughtful inclusion of alternate colored plates and bricks to lend a well-weathered look to the walls. I also like the way that Tony has crafted modules with subtly curved ridges to give the outpost a stacked, cobbled together look. 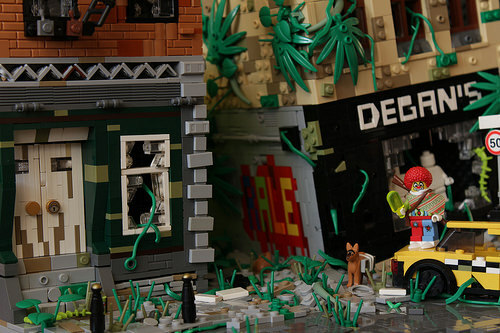 Either I was more exposed to post-apocalyptic LEGO creations or they were actually more common back when I joined the LEGO community nearly a decade ago, but this theme always brings back memories of immersive scenes filled with danger and adventure. Zombies, bunkers, bullet holes and toxic waste — what else does one need? The seemingly simple theme actually hides limitless potential — if the whole world went down, there are a lot of locations to build, and James Libby chose to show us a desert. 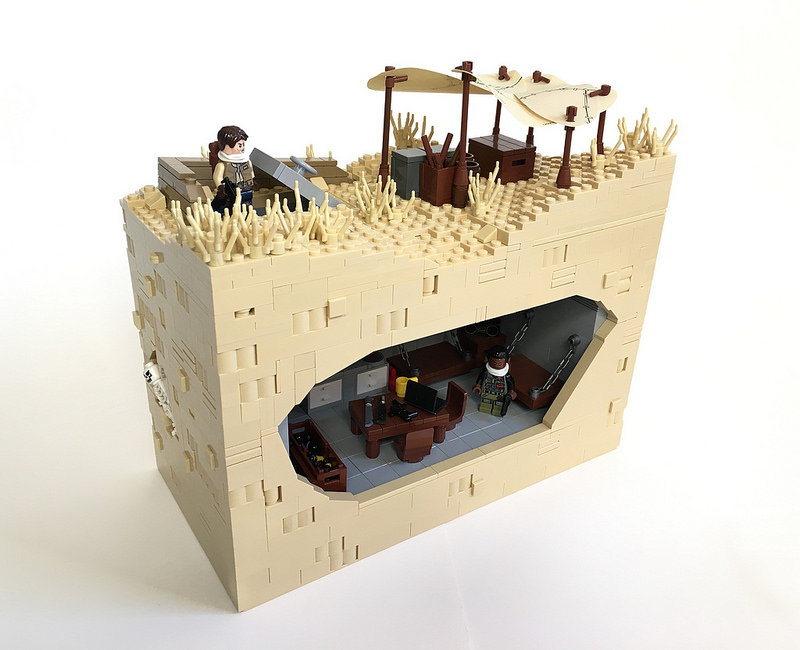 The main feature of the scene is the cutout showing an underground survival bunker including some utilitarian furniture, and of course weapons. The top has some nice details too, the best and the most subtle one being the little wall around the trap door, which has just the slightest tilt to it. What I like the most though is the tan border. The texture adds depth, while the stylish cutout and the skeleton “buried” in the sand create an atmosphere reminiscent of a comic panel. A man built a thing. He had a name, in those long-before times when salmon ran in the streams like silver clouds in the moonlight and people went about their business in great cities gleaming with glass as yet unmelted by fires from the sky. His name was Patrick B. The thing he built was built from bricks and told a story. A story about a man and his child a boy. That story was first told by a man named Cormac McCarthy in a book called The Road. A book is a thing made of trees but you cant eat it like you can bark and leaves and the little stems that try to push their way toward the darkened sky at the end of the months of snow. This thing this story these bricks by the man Patrick show the man and the boy as they walk long miles along long roads to the sea. It is a thing to behold. A thing you cant look away from. 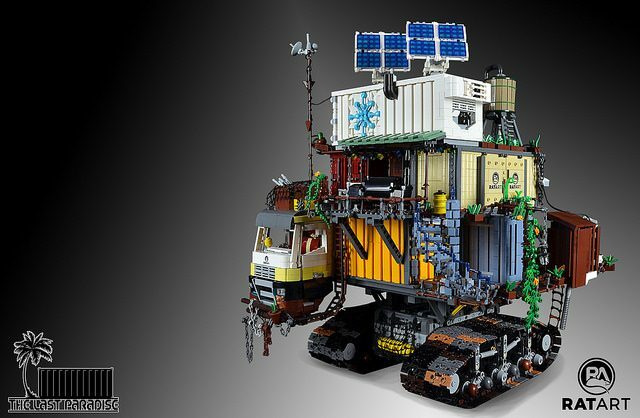 When it comes to post-apocalyptic LEGO creations, there is a vast selection of sub-genres that builders are inspired by, from cyber-punk, to wasteland survival, to monster/zombie/alien-infested worlds… and so many more. 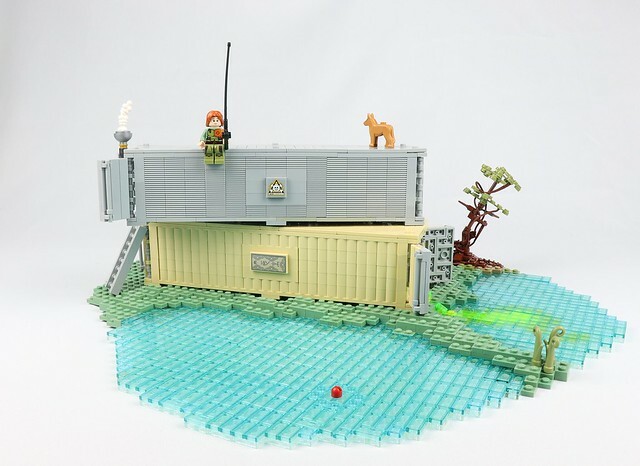 This scene by LegoFin. is set in a world where massive flooding and pollution have forced survivors to carve out a life among the crumbling remains of cities. Aside from some very well-textured and very broken walls, I especially like the use of black bars throughout the structure for re-bar. This creates an even greater sense of danger and hostility in the environment. One missable detail is that the entire outpost is supported by a few small supports precariously balanced over the water. Then there’s all those utilitarian details like the radio tower, weather vane, and solar panels that complete the scene very nicely. Creating a street scene with real character is all about the details – big and small. And when it comes to post-apocalyptic scenes, like this street scene by Jan T. the best details are in the destruction and erosion of man-made structures as nature re-claims what is hers. I’m not sure how I feel about the clown. Either it would freak the heck out of me if I were to encounter him on the street, or it would bring a smile to my face, and we would share a laugh as we scrounged for supplies. There are so many great parts used in this scene and one of my favorites is the use of the twisty stem surrounding the large leaf plant part that most of us just throw away. You can find these used as vines flowing in and out of the buildings. Then there is the mini-fig back brackets used to create a lovely architectural detail above the door on the left building. The broken walls and windows are also quite nice.